Ukrainian bands are always a good choice for those who are looking for something different from usual. They work in a way that will reveal to a Metal fan a set of different musical insights, and a total new musical universe will open its doors. 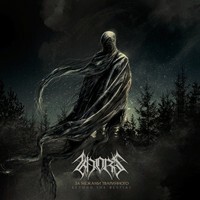 If you’re into Metal deeply, you’re going to understand what these words means when hearing “Beyond the Bestial”, the new EP from KHORS, a quartet from Kharkiv. It’s an elegant, experimental and melodic form of Black/Death Metal that will guide the listener back to the 90’s in some moments, but that points to the future as well. They prefer to use long songs to show all the rhythmic changes and musical elements that are boiled on a cauldron of influences and give back this wonderful form of music. It’s personal, aggressive and filled with energy and great musical elements. It’s hard to describe all the beauty and energy of “Beyond the Bestial” with mere words. The sound quality of the album is amazing. It mixed the aggressiveness and elegance of their music with a clean and defined sound, but bearing some traditional features of Black Metal on the instrumental tunes (as can be heard on the guitar riffs). It’s heavy, aggressive and clean, in a different way that is used by bands in similar ways to their work. “За межами тваринного (Beyond the Bestial)” is filled with a fine contrast between aggressive guitar riffs and introspective melodies (with the help of great keyboards parts played by the special guest Mihaylo Kujba); keeping the elegant outfit with charming melodies, “Крізь обрій ненароджених зірок (Through the Realm of Unborn Stars)” presents a very good on bass guitar and drums; clean guitars and great harmonies introduces “Холодний морок душі (Frigit Obscurity of Soul)”, that evolves ton amazing with a grandiose feeling (and excellent guitar solos as well, where traditional Heavy Metal touches can be heard); presenting some traditional Melodic Black Metal parts, “Зимовий поступ (Winterfall)” is another great song with charming melodies and good lead guitars parts; “В морозних обіймах імли (In the Cold Embrace of Mist)” shows a melancholic feeling, with excellent grunts; and “Червоні дзеркала (Red Mirrors)” is a very deep and melodic song, with an acoustic approach, using clean vocals and guitars, giving a Pagan/Folk touch to the EP (it’s a new version for the old song from the band from “Mysticism”). “Beyond the Bestial” is coming in the beginning of this year, so it can be on the list of the best releases of 2019 without a problem. Just hear it, and you won’t regret the experience.